Site Preparation Methods and Operation - BEST Inc.
After removal of the BGA from the PCB the removal site must be dressed. Since the balls are eutectic alloy soldered to both the part and the PCB, some of the ball will likely remain on the PCB after part removal. The remaining solder may be nonuniform in both composition and volume. The volume varies due to how the molten solder separates between the ball and the carrier pad surface. This operation entails removing all the solder balls and removing all of the solder residue. Only then can the site be dressed. 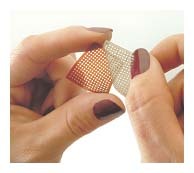 The dressing of the pads can be done by one of several methods. The methods for solder removal include the solder wick or solder vacuum techniques. The solder vacuum process has less chance of damaging the pads while being somewhat slow. The braid technique, while faster, can lead to lifted pads or otherwise damaged solder mask areas if not done properly or with the right size of wick. 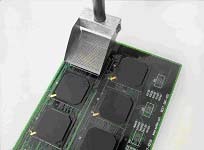 After solder removal from the pads of the BGA site cleaning is performed or not performed depending on whether a water-soluble or no-clean paste flux has been used. Cleaning parameters would follow those used in the initial assembly of the product. "Course: BGA Rework-A Primer-Site Prep"
The technology of dispensing solder paste has made many advancements and improvements. Most of the advancements have occurred in the fully automated systems and include changes to the needle configuration, the pump mechanism, and the programming. Although it is possible to manually dispense solder paste with a syringe and needle, it would result in too many inaccuracies and excessive cycle time. The use of semi-automated dispensing systems which control the quantity of paste deposited by adjusting air and timer settings provides greater control over the paste quantity, but will not improve accuracy. A fully automated dispensing system usually consists of an X-Y table and a computer controlled dispense head. These systems are programmed with the coordinate data for the locations requiring solder paste and then sequentially dispense the paste at the desired locations. They are very accurate in the paste deposit placement providing very consistent paste deposit quantities. However, one of the drawbacks of using a dispensing system is the requirement to use a solder paste with a lower metal content. Higher metal contents (87%) usually result in frequent clogging of the nozzle. With this lower metal content, the paste deposit is more prone to slump and separation than higher metal contents. Applying paste to the same locations on many boards is fairly easy due to the programming of the system and fixturing of the PCB. The major drawback to the dispense system is throughput. For larger pin count BGAs, cycle time is limited by the maximum speed of the pump and may take as long as five minutes when set-up time is included. From a rework point of view, the program and set-up time must be included for every different BGA to be processed. Metal stencils Metal stencils for depositing solder paste have been in use for decades. Metal stencils for selective (a particular device, not the entire PCB) solder paste deposition have been in use almost as long. One of the greatest yield detractors in the SMT manufacturing process is the solder paste application process and the same holds true for the solder paste application process for rework. The process steps for using a component specific stencil for selective solder paste deposition for rework and a full PCB stencil for the original SMT manufacturing are almost identical. The major difference between the original stencil printing process and the selective solder paste printing process used for rework is the amount of process control. During the original solder paste stenciling process there are machine controls for the squeegee speed and pressure, snap-off distance, removal of the stencil from the board, and in some cases stencil alignment. The selective solder paste stenciling process is very dependent on the skill level of the technician to manually control these same variables. The metal stencil printing process begins with the stencil being aligned with the land patterns on the PCB, then the stencil must be held in place in a manner that ensures intimate contact with the PCB. Next, a squeegee is used to roll a bead of solder paste across and down through the apertures of the stencil. Finally, the stencil is lifted from the PCB surface resulting in finely defined solder paste deposits. If the stencil printing operation runs perfectly, the cycle time is very fast. Cleaning the stencil is a critical process step to ensure the stencil will provide acceptable results on the next BGA to be reworked. One variation on the metal stencil process is to print the solder paste directly onto the solder balls instead of the BGA lands on the PCB. This method provides the advantage of printing solder paste where placing a stencil on the board would be impossible due to space considerations. Volume Consistency of Paste Deposition Fair - Dependent on stencil/circuit board flatness and operator squeegee skills. Good - Flexible polymer with adhesive sealed apertures ensures consistent volume. Fair - Dependent on stencil/circuit board flatness and operator squeegee skills. Circuit Board and/or Device Planarity Requirements Circuit board and stencil must be very flat. Non-dependent on circuit board or component flatness. Circuit board and stencil must be very flat. Print Registration Accuracy Excellent Fair - Stencil must be carefully taped to circuit board surface Fair Stencil must be carefully taped to circuit board surface. Component Site Access Good - Component perimeter clearance .025" - .075" typical. Good - Component perimeter clearance .025" - .075" typical. Fair - Component perimeter clearance .075" - .150" typical. Stencil Maintenance & Cleaning Requirements NOT REQUIRED. 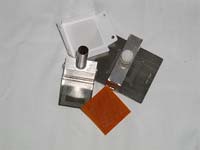 Stencils are affixed to the circuit board underneath the BGA None - Stencils are disposable after single or multi-use. Moderate - Flatness must be maintained and apertures well cleaned between uses.